Look, I’m a die hard Alien fan. I loved the first movie for its creepy subtleties, the second one for its humor and bombast, and the third one for its darkness and attempt at something fresh. I even liked some parts of Alien: Resurrection, though it was terribly flawed. Then time passed and eventually we got the mother of all pre-prequels: Prometheus. 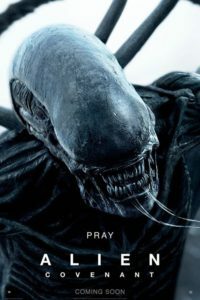 I wanted it to be something great to start a new era of Alien movies, but it was mired in idiotic writing that only a Damon Lindelof can create. I think Ridley Scott is a fantastic director, but I think he is a master at visuals and he only got lucky before, because the stories were good. Now, the stories stink and he just gussies it up with lush landscapes and superb CGI. Michael Fassbender is the one redeeming part, as usual. There are some good visuals (as mentioned before) and it works as a strictly mind-numbing horror monster movie. Beyond that, it doesn’t bring anything new to the table. I don’t really care how the xenomorph evolved, but I do care that the characters don’t have safety protocols when entering a new environment. Or that they don’t adhere to strict quarantine rules when someone becomes infected with something.